Most oral surgery patients experience some bleeding and swelling in the first 24 to 48 hours after a tooth extraction. Fortunately, simple home remedies can help you control and treat these symptoms and promote faster healing. If swelling and pain worsens after two days or persists without change after one week, contact your oral surgeon. Place damp gauze over the wound to control bleeding after the extraction. Change this gauze every 30 minutes or according to the schedule your oral surgeon recommends. 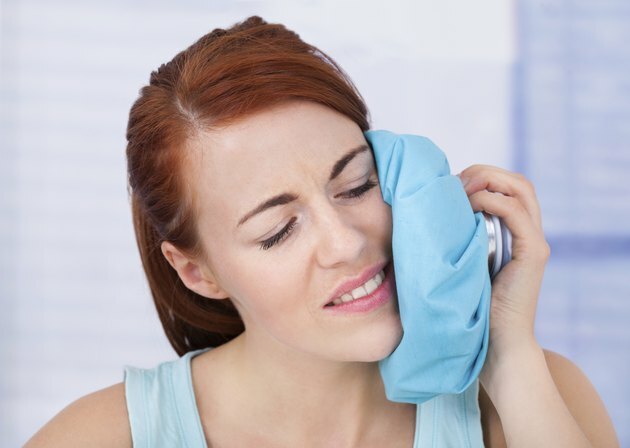 Apply an ice pack to the outside of your face at the site of the extraction. Leave the ice pack on for 10 to 20 minutes and then take it off for 10 to 20 minutes. Repeat this cycle continuously for the first 12 to 24 hours after your surgery. Continue icing even while sleeping if possible. Keep your head elevated for the first 12 to 24 hours after your surgery, including while sleeping, if possible. Apply moist heat to the swollen area 36 hours after the extraction. Do not disturb the wound. Keep your fingers and tongue away from the site of the extraction and do not smoke for 72 hours. Avoid blowing your nose violently. All of these actions can dislodge clots and slow healing, leading to more swelling. Maintain a diet of liquids and soft foods for the first 24 to 48 hours after extraction. Common post-op diets include pudding, yogurt, mashed potatoes, smoothies and soups. Do not drink alcohol for at least 48 hours after the extraction.